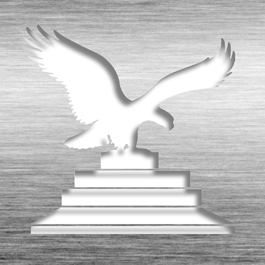 Sizes: 3 1/8" x 8 1/4" and 3 1/8" x 10 1/4"
This optically perfect award is designed to remind one of one's accomplishment. Great Innovation deserves great recognition. A stunning combination of vivid blue and pristine crystal supported by a brushed silver aluminum base. 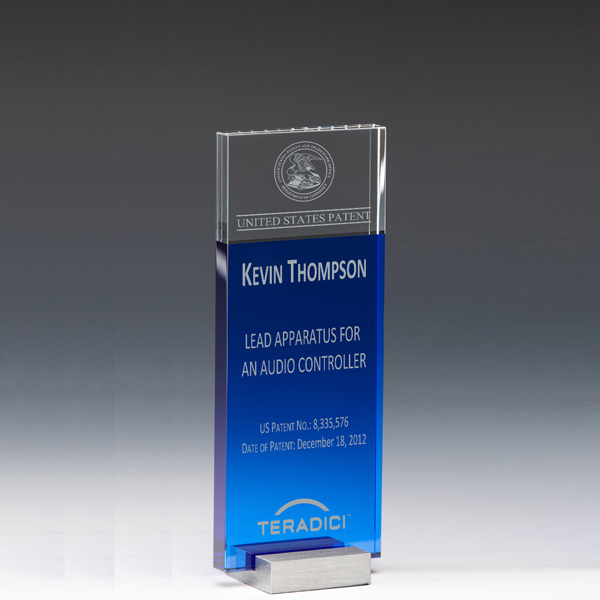 This custom award is perfect for any desk or table top display. Available in two sizes chosen below. 8 1/4" x 3 1/8" x 2" and 10 1/4" x 3 1/8" x 2"
2 1/2" X 6 1/4" or 2 1/2" X 8 1/4"
This Patent Award - Optical Crystal InnoTower CP7784 is part of our Patent Desktop Award Series of products, check out other products & options available in the Patent Desktop Award Series of our selection. This Patent Award - Optical Crystal InnoTower CP7784 can be modified to your requirements and is available for your corporate award programs.